A few days ago I bumped into my this Badger. I see Badgers erratically on the quieter Dorset roads at night, but this is this first time I've ever seen one alive in the daytime, albeit during the early evening. Sadly, Badgers haven't had a good last year. The Department for Environment, Food & Rural Affairs, DEFRA, are insistence than they need to kill them to tackle bovine TB. We had several years of scientific culling in the Blair era that looked at culling & concluded that a cull was likely to make things worse, not better. However, the DEFRA minister Owen Paterson ignored this scientific evidence & decided culling will be better under his leadership. But the 2 pilot culls failed miserably last year, even after DEFRA's solution of moving the goalposts by reducing the estimates of Badgers in the cull areas (to make their cull percentages look better), extending the cull to try & hit their targets (which they still failed to do) & blame the Badgers for not cooperating with the cull. The official independent expert investigation into the cull concluded it was 'ineffective & not carried out humanely'. In March, a full day back bench discussion in Parliment concluded with an MP vote of 217 - 1 that the cull had 'decisively failed'. Frustratingly, despite the strong scientific evidence & views of Parliment, Owen Paterson has insisted it's right to carry on this failed process this year in the 2 cull areas as well as stopping the independent monitoring. We can only hope that the public which is not in favour of the cull, remove him in the next general election. For further information of the campaign to oppose the Badger cull & how to support it, have a look at the League Against Cruel Sports. Placed upon its own on the grass to the left of the church entrance, is a single gravestone to Sergeant William Lawrence. A few years ago, I tried to find out a bit more about this well decorated soldier & was surprised with the information I found. He was born in Bryant's Piddle, Dorset in 1791. After joining the 40th Regiment Foot, based in Dorchester, he travelled & fought in many campaigns. The 40th Regiment Foot has long since been amalgamated within the British Army & was incorporated into the Duke of Lancaster's Regiment in 1881. A few years after Waterloo, he finally left the army & settled in Studland, where he ran the pub for many years (presumably the Bankes Arms). Once he left the army, he arranged for an autobiography to be written about his military career. The book can be downloaded (for free) Autobiography of Sergeant William Lawrence & it's an really amazingly interesting read. I suspect there aren't that many autobiographies from this period, with the vast majority of those that do exist coming from the wealthy officer class, rather than from the ranks. It is also interesting as it shows the difficulty of living as a member of the British army at the time & how they had to life off the land. It's a remarkably honest account of daily life as a soldier. It would be a great subject for somebody like Dan Snow to cover in a TV program. So next time your birding in Studland, check out this gravestone & perhaps you will be rewarded with some interesting migrants as well. Every few days I check out the Great-crested Newts in the pond. They are best seen after dark as they are fairly shy. Was really pleased to see I've now got 3 males & a female: which is a nice improvement on the single male of last Summer & the pair seen earlier this Spring. Couldn't resist a few more photos of my favourite garden resident. In recent days, the tides have been rising in late afternoon/early evening which is always a good time to visit Middlebere. Middlebere is one of the last places in Poole Harbour that gets covered over & therefore, there it's a good place to look for Waders & other species to congregate on the rising tide. It is also one of the favourite places for Spoonbills to feed undisturbed as well as preen & sleep. It's great to be able to see them feeding so actively, as all my early memories of Spoonbills in the UK were of sleeping birds at places like Minsmere. Was settling down this am to start adding the recent Western Sahara sightings to my birding database, when had a call from local birder, Graham Armstrong. Calls from Graham are usually reserved for something interesting on the bird front. This was a bit more interesting than normal: concerning a large Pipit & not a Tawny Pipit on Greenlands Farm, which abuts Brands Bay at Studland. From the mainly flight views he had seen at that stage, he wasn't ruling out a Blyth's Pipit, but was leaning towards Richard's Pipit. Well this is my local patch & any large Pipit would be a Studland Tick, with Richard's being a Harbour Tick & Blyth's being a UK Tick. Time to press the panic alarm. Grabbing the camera, I had enough time to ring another local, Nick Hopper, & get him to phone some news on as I was heading out to the car. Normally, I tend to phone the news out around the locals, but this was one of those cases where I just needed to scramble asap. Arrived about 15 minutes later & started to walk down the track to Greenlands Farm. As I got to the first field on the right hand side, I saw a pale orangey-pink lump at the back of the field. Told myself it was a Hoopoe as I raised the bins, knowing that it would be for the next 10 seconds until I got the bins onto it & reidentified it as a horse turd or piece of wood. After all Hoopoe would be a patch Tick & while the field looks great for a Hoopoe, I've checked it many times over the years & never seen anything better than a Redstart in it. Got the bins on it & wow, it was a Hoopoe. Whilst grabbing some record shots, I rang Graham to tell him about the Hoopoe as he was only 100 metres away. Two conflicting thoughts running through my mind at this point. Elation about finding a patch tick, but frustration about getting Graham to leave the much better quality Pipit (wasn't even aware that Graham had now put the news out as a definite Richard's). Still the Hoopoe was happily feeding & should be quick to show it to Graham, so we could then concentrate on the Pipit. Rang the Hoopoe news out locally as Graham arrived. Looked up to find no Hoopoe, but fortunately, picked it up soon after flying into a tree at the back of the field. Once Graham had seen it, we could head off for the Pipit. Graham said he had seen the Pipit fly a couple of times & head it call, but not the typical shreep call, but was happy it was a Richard's Pipit. But he had lost it before my arrival in the corner of the main Greenlands Farm field. We headed back & after a good walk about in that area for 10 minutes, picked it up on call & then had a flight view as it went overhead giving a two note call I didn't recognise. There again, I've not seen that many Richard's Pipits, so not recognising the call wasn't a negative thing for the identification (more a sign I would rather listen to music at home than bird recordings). I could see in flight it was a large bulky Pipit with a long dark tail with white outer tail feathers. It then flew around a couple more times on quite long flights, calling regularly as we stayed in the same area. But on each occasion it came down out of sight. We didn't want to move as we could now see Nick walking down the track. He quickly stopped to see the Hoopoe (surprisely a Harbour tick for him despite having a bigger Poole Harbour list that me). Eventually, he joined us & we explained it had gone down on the adjacent Godlingston Heath & again out of sight. Nick had some calls of Richard's which he was playing to us to see if we recognised the call. All he had was the more typical shreep call which he was playing when it went up again & flew towards us & was now giving an identical shreep call. Confirmation in my mind as to the identity as I had still only had flight views. It flew several times after that, at its own choice as we weren't moving around much as we could now see Paul Morton, who runs the Birds of Poole Harbour website. Again Paul arrived quite slowly as he got distracted by the Hoopoe he had to walk past. Then we could finally walk towards it. But it saw us well before we saw it & another couple of long flight views ensued. In two or so hours I was looking for the Richard's Pipit, I only managed to see it once on the ground & that wasn't close views, even with the telescope. Certainly, too far for a photo, but fortunately, I managed a few shots as it was flying around. Richard's Pipit: A Poole Harbour Tick & a rare Spring bird in Dorset. Calling in flight. 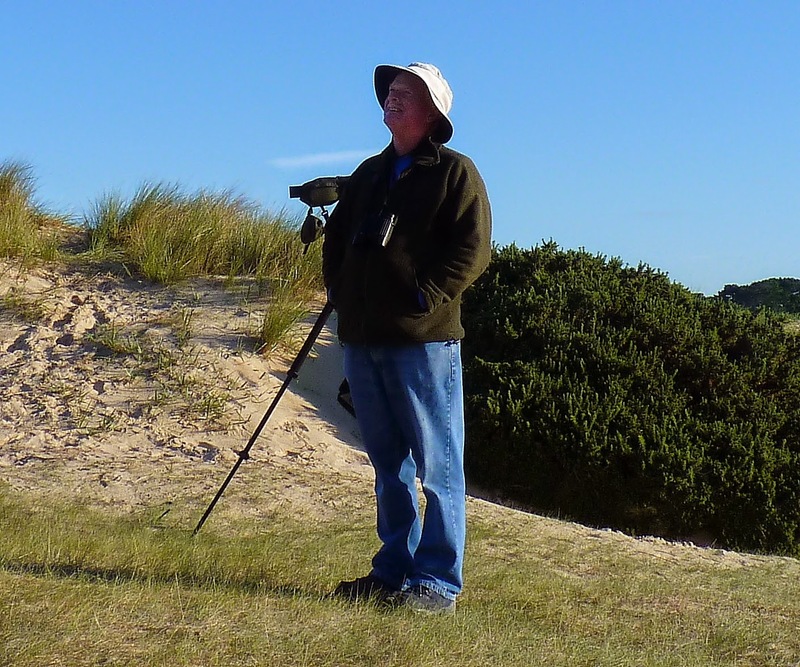 Paul Morton returned early afternoon with his recording equipment & managed to get some flight calls. They can be heard on the Birds of Poole Harbour Sightings Page. Finally, a big thanks & well done to Graham Armstrong for finding the Richard's Pipit. A great bird to find locally & his second for Studland. Graham found the last Studland Hoopoe (last year as it flew over the harbour mouth) & coincidentally, I think the last Greenlands Farm Hoopoe was found by another Poole Harbour local, Steve F Smith (no relation). One of my first long distant twitches in the UK was for a Desert Warbler at Meols. I remember it was a great bird to see. I decided to blow part of my university grant on an overnight train there from Southampton, but hitching back South to save some money for what my student grant was meant to be used for. In those days, it was just a single species. However, about 10 years or so ago, the 2 subspecies were split into separate species: Asian Desert Warbler & African Desert Warbler. 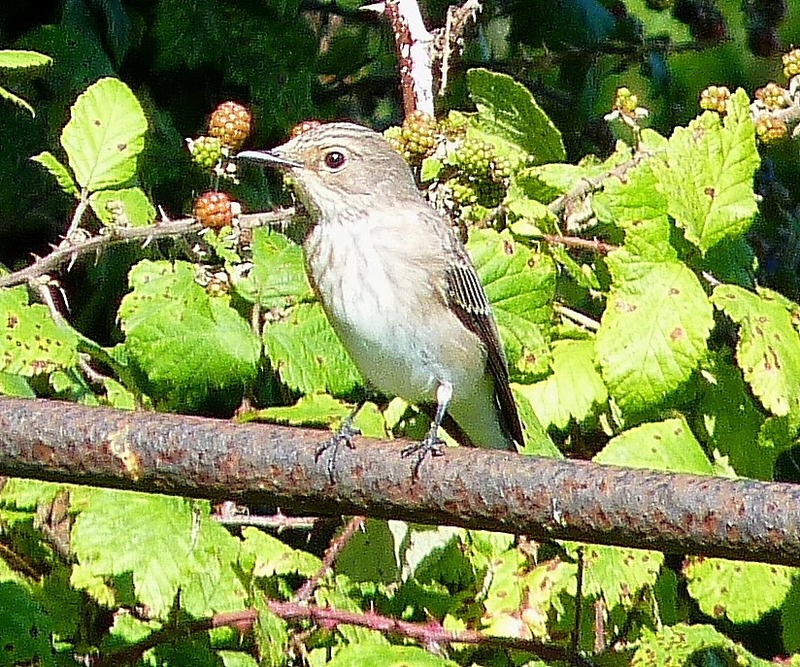 The former is still a very rare bird with only a dozen accepted records up to 2012 in the UK. This is a regular migrant as many leave their harsh, high altitude, desert habitats to winter in India & NE Africa and it's not too surprising that they occasionally end up in Western Europe as vagrants. The latter is at best a local migrant (perhaps moving in response to rain or the lack of it) in the North West African deserts & has never occurred in the UK. I've been luck to see & photograph both species this year. Therefore, it's an ideal opportunity to recycle some photos into another post, as well as posting some additional unseen photographs. But it is also an opportunity to look in more detail at two closely related species. Most of the birds in the deserts in NW India are Winter visitors, but they were feeding in small parties & were moving around with a Desert Wheatear in each case. This is much the same behaviour as my local Dartford Warblers following their Stonechat friends on the local heathlands. I'm not sure what the Desert Wheatears & Stonechats get out of the relationship, but the Warblers get a good lookout which frequently perches up high. The African Desert Warblers were a lovely pale golden brown colouration, whereas the Asian Desert Warblers were a colder grey brown. African Desert Warblers have plain tertials & central tail feathers, in comparison to the dark centres to the tertials & central tail feathers on the Asian Desert Warblers. Of the two, the African Desert Warblers were easily the better looking bird, but both are great species to see. Their feeding habits were very similar, both feeding on or close to the ground & moving quietly between clumps of vegetation. I didn't hear calls from either species whilst I was watching them. I was surprised to find that the more resident African Desert Warblers were feeding unobtrusively & didn't appear to have any Desert Wheatears around them. Perhaps there are more subtle habitat differences which separated these two species (where I saw them), as both appear to be resident in the Western Sahara. The title of this blog is Birding Poole Harbour and Beyond. Well there has been plenty of Birding & Beyond, but surprisingly little of Poole Harbour so far. So guess I had better start addressing that. One of my favourite sites in Poole Harbour is Brands Bay, Studland. This is split into the inner bay, which has a bird hide & the outer bay where the bay extends into the direction of the Brownsea channel. A recent visit on the rising tide confirmed that the typical Spring migrants were around.